Talks on the future of Syria opened in Geneva today, with U.S. Secretary of State John Kerry among the many foreign ministers present. Iran will not be participating after the United Nations withdrew a formal invitation under American pressure–an invitation issued only after the U.S. had indicated clearly that it would, in fact, be open to Iranian participation. 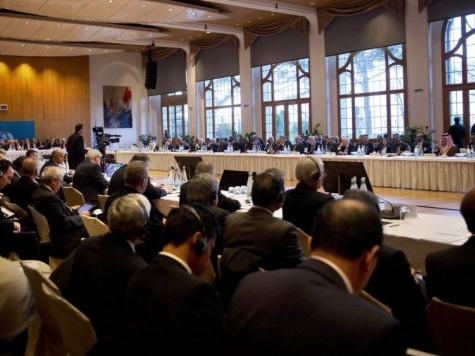 The chaotic prelude highlighted the emptiness of the Syria talks themselves. Earlier this week, new evidence emerged of torture and mass slaughter by the Syrian regime. Already, Bashar al-Assad has used chemical weapons against civilians, which triggered much hand-wringing late last summer as the White House backed away from President Barack Obama’s “red line,” having already squandered earlier opportunities to intervene before the Syrian opposition became dominated, and divided, by radical Islamists. The deal brokered by Russia–via a classic gaffe by Kerry–saved some face for the administration but effectively ensured that Assad will stay in power, since only he can guarantee compliance with international chemical weapons monitors. The U.S. now insists that this Geneva conference adhere to its interpretations of the last one, i.e. that Assad must go. But it is a lame posture, not backed up by military commitment, and everyone knows it. The entire diplomatic farce–the talks, as well as the drama over Iran’s involvement–has become an exercise in vanity by the Obama administration to convince the world, and itself, that it is “doing something” about Syria. It must haunt the Samantha Powers of the administration to know that they are doing precisely nothing, and that they foolishly trusted Obama to do the right thing–the strategic thing–when he had the chance. It’s gone.